Hi, I'd like to know the map boundaries of each UK Map. Is there a reference that shows the boundaries between each map so that I know which ones to download? Which downloads are you talking about? Maybe http://garmin.openstreetmap.nl ? Or some other website? Or some app? I'm talking about the OSMAND maps. Note: tapping on download regions only works for lower zoom levels. Hi, I don't think there is a picture view of map boundaries. 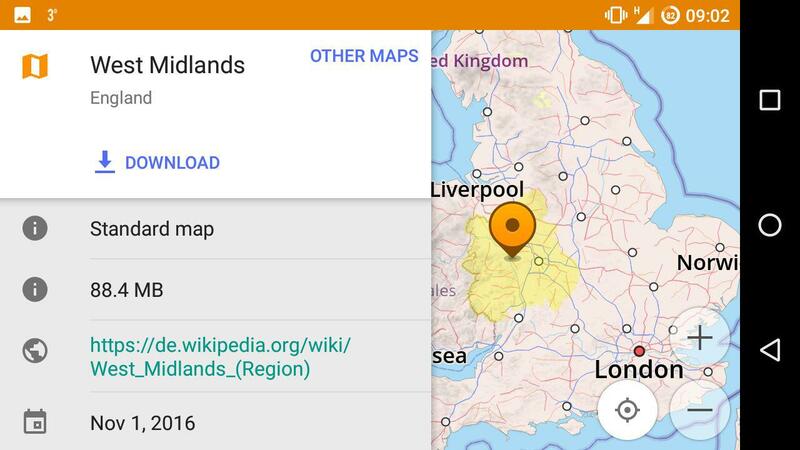 From the Map Download menu within OSMand+ the areas can be expanded by clicking/tapping headings until all areas are shown. Click Europe = (individual country's in Europe). Then click UK = (the four country's in UK). England = (the areas of England). East of England = (standard map file for that area). Thanks for your answers folks. The problem is knowing in a bit more detail which map covers which area, for example what does 'East Midlands' include? For England it's simply a bit of a faff as you potentially need to download a little more than needed. But what about regions of countries that you're maybe not so familiar with, France or Germany for example? I've downloaded the World Basemap and can now see what looks like an overlay of the local maps that I've downloaded shown in green. Thanks for the tip. With the world basemap loaded & the map zoomed out, I can now see what areas I've downloaded (shaded in green) and if I tap an area that's not shaded green it does indeed tell me what map covers that area. I don't get the example screen you've shown in your reply though. Maybe that's something to do with the (free) version of OSMAND that I have or the way it's set up on my phone. Please add your comment as a comment and not as an answer. Regarding the screenshot: The popup looks different (i.e. less detailed) with vertical orientation.